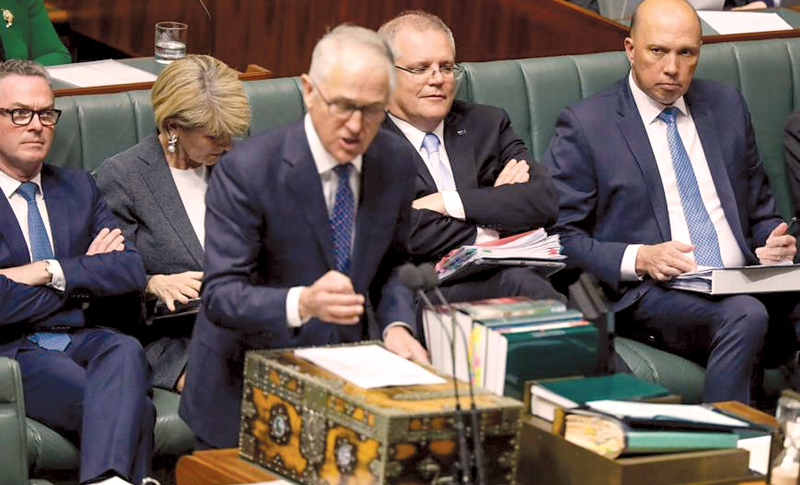 Australian Prime Minister Malcolm Turnbull speaks in Parliamnent with his challenger for the party leadership Home Affairs Minister Peter Dutton on right. AUSTRALIA: Embattled Australian Prime Minister Malcolm Turnbull pleaded for unity Tuesday after narrowly surviving a leadership challenge as discontent with his rule boiled over less than a year before national elections. “It is really important that we put these differences behind us and get on with our job of looking after the 25 million Australians who have put us here,” he said afterwards. “We know that disunity undermines the ability of any government to get its job done, and unity is absolutely critical.” There was also an election for deputy leader. The incumbent, Foreign Minister Julie Bishop, was the only one who threw her hat in the ring and she held onto the role. “This was a trial run and I expect them (Dutton and supporters) to do it again in September,” he told AFP, adding that it was all about “revenge and ego”. “What is my next step, what is my job from here? My job is to make sure I can prosecute the sort of messages I spoke about and that is the only thing I am focussed on,” he said.